I made it with Tommy (of Goo! fame), he was awesome to work with and had some great input that really made the game (ie the trinity attack). I'm very proud of the outcome, its unlike anything else ive done. Grey Matter is an "Anti-Shooter". 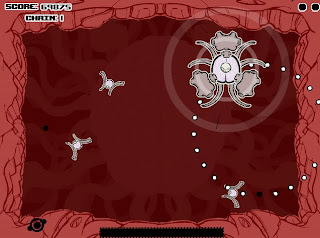 Basically a shooter in the genre of Robotron / Geometry wars, except you don't shoot bullets... you are the bullet. Run into the exposed brains of incoming attackers to destroy them. Killing 3 of the same type of enemy will cause a "Trinity attack" killing everything inside it. The games story is left up to interpretation and (like most of my games) vague enough to not matter to those who are just looking for a quick play, but cryptic enough for people to pick it apart and find its deeper meaning. When it comes to authentic Chopard watches, you will find beautiful gold, silver or stainless steel with an extraordinary face sometimes accompanied by diamonds. If you begin looking at and shopping for a Chopard Watches , there are subtle differences that you will find.Aside from the actual material they are made from, the main difference will come in the face of the watch. Some of the differences between an authentic Replica Chopard and a Replica Chopard Watches may include the plating of the face and the encasing of the face. Sorry but i can play games same this in a Atari video game or nintendo year 90, it is a mini game extended. I only fun if your can make game on level of tri-achnid or better, games with a story, with a good career mode.